A man of many talents, Stephen Fry has established himself as an actor, novelist, comedian, social media and technology addict and all-round wit. Fry’s childhood and time studying English at Cambridge has been well documented in his autobiography MOAB is my Washpot (1998), and these early years have provided him with much of the content for his novels. In particular The Liar (1991) tells the story of a reckless ex-Cambridge student who becomes involved in an international espionage caper. The novel contains many episodes clearly inspired by the younger Fry. At university, Fry became involved with the Cambridge Footlights, where he met his longtime collaborator Hugh Laurie. As half of the comic double act Fry and Laurie, he co-wrote and co-starred in A Bit of Fry & Laurie, and took the role of Jeeves (with Laurie playing Wooster) in Jeeves and Wooster. His acting roles include, among others, Melchett in the highly acclaimed BBC series Blackadder, the titular character in the TV series Kingdom, a recurring guest role as Dr. Gordon Wyatt in the crime series Bones and as Gordon Deitrich in the dystopian thriller V for Vendetta. His most notable performances as an actor are Peter’s Friends (1992) and Wilde (1994) in which he fulfilled, to critical acclaim, a role he believes he was born to play. He has also written and presented several documentary series including Stephen Fry: The Secret Life of the Manic Depressive, which saw him explore his mental illness and earned an Emmy Award. In 1984, Fry was asked to re-write the musical Me & My Girl, which earned him a Tony nomination. In 2003, Fry made his directorial debut with Bright Young Things, adapted from Evelyn Waugh’s novel Vile Bodies. He has been a keen contributor to national newspapers over the years, in particular The Daily Telegraph. In 2003, Stephen began hosting QI (Quite Interesting), a comedy panel television quiz show. QI, featuring permanent panelist Alan Davies, attracted the highest viewing figures for any show on BBC Four and UKTV G2 (now Dave). In 2006, Fry won the Rose d’Or award for Best Game Show Host for his work on the series. In 2005, he was the voice of the book in the big screen version of The Hitchhiker’s Guide to the Galaxy by the late Douglas Adams. He also appears frequently on BBC Radio 4, starring in the comedy series Absolute Power, being a frequent guest on panel games such as Just a Minute, and acting as chairman for I’m Sorry I Haven’t a Clue. At the 2012 Pride of Britain Awards (ITV), Fry, along with Michael Caine, Elton John, Richard Branson and Simon Cowell, recited Rudyard Kipling’s poem If as a tribute to the 2012 British Olympic and Paralympics heroes. 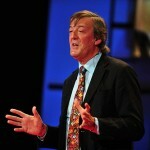 In the London event world Stephen Fry is known as a renowned and supremely accomplished awards host.